Who are the "great people"? I saw Carmen in action at PS 6. We define words differently....I put the health, safety, and welfare of the children first and I mean it. 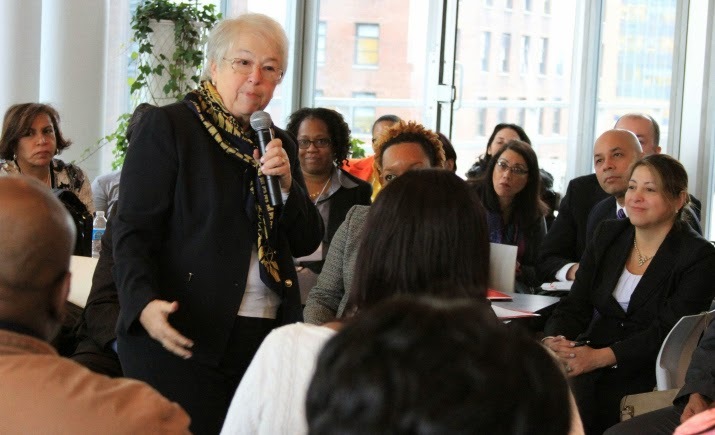 The school-support networks created during the Bloomberg era are shedding leaders and staffers ahead of an overhaul of the city’s school governance system, which Chancellor Carmen Fariña will announce next week, according to multiple sources. Fariña will reveal changes to the way schools are managed and supported during a speech next Thursday at the Association for a Better New York, according to network leaders and teachers who were told about the speech by their union president. The revamped system is widely expected to diminish or dismantle the support networks and restore authority to district superintendents, who were weakened under Bloomberg. Several current network leaders have already taken new jobs working for superintendents as “principal leadership facilitators,” according to principals and network leaders. “A bunch of my colleagues have applied, gotten offers, accepted, and are starting their jobs in the next few weeks,” said one network leader who, like the others, spoke about the behind-the-scenes reshuffling on the condition of anonymity. That represents a major power reversal for network chiefs who, under the previous administration, overshadowed superintendents. While network leaders oversaw staffs of a dozen or more employees who helped principals run their schools, superintendents had only a handful of helpers and served mainly to evaluate principals. Meanwhile, some network employees are leaving to work in schools or various education department offices, even as a network hiring freeze keeps their bosses from replacing them. The effect is that some networks have had their operations undermined before they have officially lost any authority. “The transition is happening without anybody announcing anything,” another network leader said. At one recent meeting, an education department official told a group of network leaders that they should “seriously consider” applying for those new roles, according to an attendee. Lately, some network chiefs who had planned to wait until the new governance structure was announced have started applying for the openings in the superintendents’ offices because they don’t want to lose out on their chance to take them, several said. "I think everybody right now is trying to think about their careers and how they’re going to survive this transition,” one network leader said. She added that superintendents, who have orders to build up their own teams, are eager to recruit highly regarded network leaders before their peers poach them. “All the superintendents are trying to grab all the great people now before they’re all gone,” she said. Some principals said they were upset that the city is allowing all this hiring to happen before any official restructuring has been announced. The principals are also worried that the reshuffling might mean they will have fewer places to turn for support during the transition. A Brooklyn principal said some of her colleagues have already found that network employees they used to work with regularly have recently left. She worried that as she tries to push her own students to graduation this year and starts hiring for next school year, she might not get the support she needs. Education department officials said that no school governance changes have been made yet, but that when they are, they will be announced early enough to allow a smooth transition before next school year. Spokeswoman Devora Kaye added that many families and school leaders have not been satisfied with their support networks. The system of nearly 60 networks, which span multiple boroughs and usually support about 25 schools, has earned mixed reviews over the years. Principals who favor the system point out that it separates support from supervision, allowing school leaders to share problems with their networks without fear of reprisal. Their ability to choose which network to join, they say, lets them collaborate with like-minded colleagues outside their geographic districts. But critics call the structure inefficient and impractical, leaving low-performing schools with too little oversight and parents without local officials to turn to. They point out that network leaders cannot compel the leaders of struggling schools to make changes and say that the quality of the different networks vary widely. At a meeting Wednesday, United Federation of Teachers President Michael Mulgrew told the teachers to expect an announcement about a new school-governance system the following week, according to attendees. He also criticized the networks, which he has attacked beforefor focusing on schools’ compliance with city rules than instruction.